The nuclear weapon missile business is contradictory, full of missteps, highly dangerous and prepared in its madness (Mutually Assured Destruction, aka MAD, they used to call it in Cold War days) to plunge the world into a nuclear war that will reduce most of the world to dust. 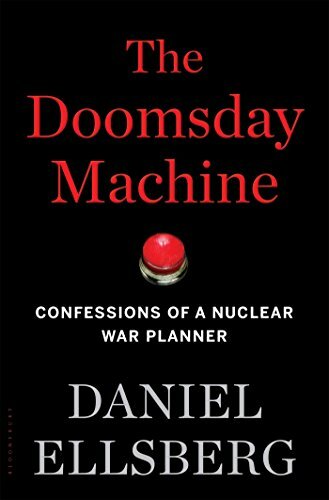 A new book, The Doomsday Machine by Daniel Ellsberg tells the whole nuclear bomb story in detail. No one has done it better. The only rival is the movie Dr. Strangelove that got the essentials right without being privy to much of the Ellsberg’s knowledge. Ellsberg is the legendary whistle-blower who revealed the Pentagon papers, an expose of the U.S. role in the Vietnam War. In this book he tells of his time in the 1960s as consultant to the Department of Defense and the White House. He drafted Robert McNamara’s plans for nuclear war—McNamara was secretary of defence during the presidencies of Lyndon Johnson and John F. Kennedy. Five years ago, after he had finished the book, he tried 17 different publishers and it was rejected. Earlier this year he found a home with Bloomsbury. Why, at last? “The world got scarier”, he said in a long interview in the Financial Times last month. “The only silver lining to today’s world is that people now want to read my book.” Doubtless, Donald Trump and North Korea’s Supreme Leader Kim Jong-un will ensure good sales. There are two very tightly held secrets at the center of U.S. nuclear policy. The president of the United States isn’t the only one with his finger on the button, as has long been presumed. Long ago, starting with President Dwight Eisenhower and continued ever since, the power of ordering a launch of nuclear-tipped missiles has been devolved to a number of senior and some not-so-senior military figures. At one time submarine commanders had autonomous power when they were submerged and out of touch of radio signals, and could launch their nuclear missiles. This also used to be true of the long-range rockets deep in their silos. McNamara found to his shock that the code on the locks in the silos was set at 000000. Even today there is devolution, although Ellsberg doesn’t make it clear to whom. The other great secret is that the president’s power is circumscribed. He is using the military’s computers when he inserts his code and presses the button. The military top brass today, without too much trouble, can interfere with the decision the president has made, since it is coming at them from above and thus has to be relayed downward to those who do the actual firing. Sometimes one shivers, reading Ellsberg. In one incident he discovers that the military held its secrets about its battle plans so close to its chest that even the president, in this case Kennedy, did not know about them. Ellsberg revealed that when the National Security Advisor to the president, McGeorge Bundy, ordered the Pentagon to send him a copy of the battle plans, he was refused. On a second attempt, saying this was the president’s wish, he was refused again. Eventually, it was agreed there would be a verbal briefing given to Bundy and McNamara and the forwarding of the “plans” to the president. Ellsberg discovered that the real document was never delivered- it was just a re-written record of the briefing. It was only his tenacity that enabled him to find the original document. He forwarded it to Bundy. He was then asked to write revised guidelines on basic national security policy and this eventually became Kennedy’s new policy. And so the story proceeds over many decades, including the Cuban crisis about which Ellsberg gives frightening new information including that Russian submarines also had delegated authority—and almost used it—to fire their nuclear weapons without waiting for an order from Moscow. At one time, he records, President Richard Nixon ordered his aide, Henry Kissinger, to “think big” about using the bomb against the North Vietnamese. Gradually, Ellsberg changed under the influence of what he observed, from being an enthusiast for nuclear weapons’ policy to becoming one of its severest critics. If you doubt his concluding reasons for his Damascene conversion don’t just read the last chapter or the reviews, read the book. There are many reviewers and commentators out to diminish him. But he is the one who is absolutely right.